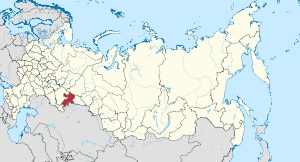 Chelyabinsk Oblast (Roushie: Челя́бинская о́бласть, Chelyabinskaya oblast) is a federal subject o Asiatic Roushie (an oblast), locatit on the mairch north o Kazakhstan. Its admeenistrative center is the ceety o Chelyabinsk. Population: 3,476,217 (2010 Census). Population: 3,476,217 (2010 Census); 3,603,339 (2002 Census); 3,623,732 (1989 Census). The oblast is heichlie urbanizit. 99,144 fowk wur registered frae admeenistrative databases, an coud no declare an ethnicity. It is estimatit that the proportion o ethnicities in this group is the same as that o the declared group. Chelyabinsk Oblast haes considerable subsurface gowd reserves, which are concentratit in ore an placer deposits. The gowd deposits are associatit wi baith basement rock an fluvial deposits. Probable reserves are estimatit at 500 tons o ore gowd an 40 tons o placer gowd. The maist important nonmetallic minerals in the region in terms o reserves are deposits o graphite, talc, kaolin, an vermiculite (rock raw materials); barite, phosphorite, an glauconite (chemical raw materials); magnesite, quartzite, fluxin limestane, an furnace dolomite (metallurgical raw materials). The discovery o mineral deposits at various times haes resultit in the construction o a lairge nummer o processin facilities. Mair than 150 companies in the region are involvit in wirkin mineral deposits an processin the raw materials. The best kent o thir are the Magnitogorsk Iron and Steel Works (MMK an Chelyabinsk Iron an Steel Wirks (Mechel). Chelyabinsk Oblast haes fifteen theaters an three concert organisations. Nine o thir theaters (five state an fower municipal theaters), an airt gallery, a philharmonic an organ haw, a circus, several museums, nineteen movie theaters, a municipal jazz centre, an a contemporary airt centre are locatit in the caipital. Tours bi Roushie an foreign airtistic companies add variety tae the region's cultural life. The Kamerata chamber theater festival an an internaitional organ muisic festival are held annually in Chelyabinsk. The region haes an extensive seestem o airt an cultural schuils, includin three heicher educational institutions: the Chelyabinsk State Institute o Airt an Cultur, the Chelyabinsk Heicher Muisic Schuil, an the Magnitogorsk State Conservatory. Thare are mair nor 20 artistic unions, associations, an groups, maist o which hae formit in the last few years. ↑ 7.0 7.1 7.2 7.3 Roushie Federal State Stateestics Service (2011). "Всероссийская перепись населения 2010 года. Том 1" [2010 Aw-Roushie Population Census, vol. 1]. Всероссийская перепись населения 2010 года (2010 Aw-Roushie Population Census) (in Roushie). Federal State Stateestics Service. Retrieved June 29, 2012. Законодательное Собрание Челябинской области. Закон №22-ЗО от 25 мая 2006 г. «Устав (основной закон) Челябинской области», в ред. Закона №427-ЗО от 30 апреля 2009 г. (Legislative Assembly of Chelyabinsk Oblast. Law #22-ZO of May 25, 2006 Charter (Basic Law) of Chelyabinsk Oblast, as amended by the Law #427-ZO of April 30, 2009. ). Wikimedia Commons haes media relatit tae Chelyabinsk Oblast. This page wis last eeditit on 8 Mairch 2018, at 05:51.